PEF is a digital image format used in Pentax digital cameras. Like NEF, CR2, ORF and other raw formats, PEF has all functions of a digital negative. Raw formats are referred to as digital negatives for the simple reason that they fulfill functions equivalent to those of analogous film negatives. They just contain all the data that normally makes a photo image. Analogous signal is captured by the sensor matrix of the camera. The signal is transformed into a digital form. Processing according to the camera’s individual settings. Image compression (some details are lost). PEF images do not undergo any of these procedures and retain a wide color gamut and luminance range. Actually, raw images are pretty close to the real picture in terms of details and colors, because they contain much more information. At the same time, they cannot be printed or operated with a bitmap graphic editor. In other words, it represents exactly what the sensor ‘sees’ and ‘feels’, very much of which is lost in JPEG and TIFF formats. For instance, the camera’s analog-to-digit converter ensures at least a 12-bit color depth or more, while JPEG files have only 8 bits of intensity information. PEF is just one of the many of existing raw formats. This diversity has resulted in numerous software compatibility problems, because each format has its own parameters. Camera manufacturers introduce their own raw formats. Worse still, formats differ even within a single brand, and each new generation of cameras requires an update. Raw formats differ in terms of data structure, and some even use compression in order to provide more space on memory cards (NEF). This sort of compression does not usually affect image quality seriously. However, the process itself takes a little bit of resource and may slow down recording. However, PEF does not exercise this approach and saves all files as they are, with all sensor and image data and metadata intact. 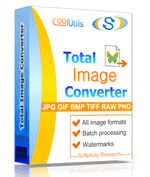 A truly powerful Total Image Converter can convert PEF files to TIFF, JPEG, PNG, BMP and other image formats in three simple steps.